Most popular YouTuber in the world, Felix Kjellberg aka PewDiePie has announced his intention of deleting his channel once it clocks 50 million subscribers. With YouTube rising to become the most popular video platform, many youtubers were birthed. Today we have several popular YouTube stars that have been able to attract millions of followers hence generating billions of views and tons of cash. YouTube’s changes to its algorithm that include new page layout that enables click bait videos to topple subscription content and censorship of popular videos has rattled most popular You Tubers. “YouTube is killing my channel, But I’m not going to let them win. I know you’re going to think I’m joking, but I’m going to delete my channel once PewDiePie reaches 50 million.” – says Kjellberg in the video. In a press statement, a spokeswoman from the video company told the BBC "We've done an extensive review and found there have been no decreases in creators' subscriber numbers beyond what normally happens when viewers either unsubscribe from a creator's channel or when YouTube removes spammed subscribers." YouTube rubbished reports that it has made algorithm changes in recent months. 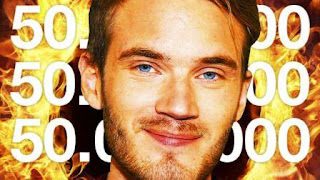 PewDiePie just made it to the 50 million subscribers mark; we are now anxiously waiting to see if he will proceed to make his threat a reality. If he does so then we could experience popular youtubers revolt against the same platform that made them rich and famous. According to Forbes report of December 2016, PewDiePie who is Swedish but lives in the UK is the highest earning Youtuber of 2016.